Since we’re at the beginning of the last four months of 2018, I thought I’d look back on my phrase for 2018, and the goals I wanted to achieve this year. I selected my phrase: “Change and Growth.” I had previously written out my goals, and as it turns out, they all do address the ideas of changing and growing. Imagine that? In order to accomplish goals, we usually do need to change our mindsets and our existing behaviors, and subsequently grow into new ones. I have divided my list of goals into 5 primary categories, as you will see below. [This is what I wrote at the beginning of the year: I have a few clients right now with various contract lengths and terms. The freelance life is a fluid entity, where long-term or permanent work is a rarity (at least in my experience going on 11 years so far! ), but I always appreciate the work when I have it to do!] As of March 21st, almost 6 months ago, I got hired for a full-time remote position, so this was a big win and goal achieved! Did you choose a focused word or phrase for 2018, to lead you toward achieving your goals? I reflect a lot on myself, my life, and what my plans are. I think it’s the only way to continue to improve. earlier this year i kept telling myself everytime something went wrong that it was just “adding color to my autobiography” these days im telling myself struggle today, strength tomorrow. and its helping a lot with my motivation to put efforts into things. I think it’s important to reflect on yourself and set goals. We can only keep going and improve day by day. This is a great phrase! I always like to make goals for myself. If I don’t complete them, I just try again. I do routinely reflect on my goals. I think it’s important so you would know if you’re on the right tract and if there’s an improvement. I tend to make goals but set things back because the year gets busy. I should start planning ahead for 2019. I love to set goal every month, but the problem is we need to be consistent and focus to the goal we’ve been set up to, that the reason I always set the things back too. Sometime, have one goal at a time is better than multiple goals at the same time. I am the world’s worst when it comes to setting goals mainly because I look at them like New Year’s resolutions and I feel like setting them just sets me up to fail. I think about all the things I want to accomplish but I never write them down. Your post has encouraged me to change that! I always wake up and start my day with “I can do all things with Christ who strengthens me.” It helps me to know that everything is going to be OK. Sometimes I set goals, but I rarely check back to see how I’m doing (or how I did). Good for you for setting goals and then checking in. I think that’s the only way it’s effective. Thanks for the reminder to revisit those goals I set earlier this year. I know I have gotten off-track on a couple of them and there’s still time to turn things aroungd. I can’t believe we are almost near the end of the year. Each week I set small attainable goals and I think this year I’ve been doing better at pursuing them. I honestly did not pick a word or phrase for the year…but I did want to focus on growing professionally and paying off debt.. SO far I feel like it has been a pretty good year! Congrats on your full-time remote position! I also love your mantra for the year – seems you are heading in the right direction. I love my freelance customer the most. I love that I get a chance to write about things I can stay anonymous about and express my true self. I hope to complete my novel this year– that’s my main goal. and my word/ phrase for the year is complete what I start. I love the last Quote- MOney is not directly proportional to happiness. This is a very interesting post with a lot of qualities people need to make note of. I always say a journey of a thousand miles begins with a single step. It sounds like you’ve been slaying your goals this year! It’s crazy to think the year is almost over. Keep up all the fantastic work! You’re killing it! It is great to reflect on goals and change them as needed. By they congrats on your new position, working remote is awesome! Congrats on achieving your goals. I try to reflect at the end of the year when it’s a bit more peaceful. I think my word for 2019 might be strength. I’m not great about making goals, but I somehow still manage to reflect on my progress. I’m trying to set more small goals so that I can celebrate success more often! I love these moments to reflect on goals. There’s still so much time to make our 2018 goals happen! I need to streamline work more so I can free up more time. Those are really great goals! The goals I created for myself were to finish my book and build up my blog. So far, the blog has been taking up most of my time, but I still have intentions on finishing my book. I always choose words/phrases and set goals. I think it’s time for me to look back and see where I am with those. I do reflect on my goal and process. However, I don’t have my thoughts so well organized as you do. I should try writing everything out and see if I feel better about my progress. 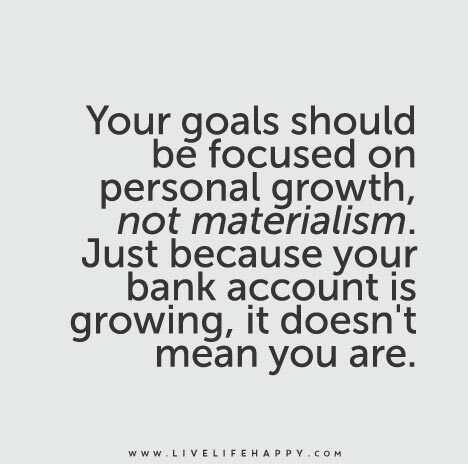 I am totally agree with this phrase “Your goals should be focused on personal growth, not materialism. Just because your bank account is growing, it doesn’t mean you are”. BTW I also reflect on my goal and process. Thanks for sharing this. This is something that I definitely need to do! I like that you chose a phrase for the year and then reflect on that! I think it is a good idea to sit back reflect on life, change is always good for the soul to make improvements to a persons life. No, I haven’t but you’re totally inspiring me! Congrats on the weightloss too! Some of your goals are my goals. I want to start doing something creative everyday! Setting up goals and reflecting upon them is really important. I try and make goals and stick to guidelines and I also try to create rewards for these goals , just so that I actually do them. Goals should definitely have to be for your own personal growth. Our goals should not be for material items! 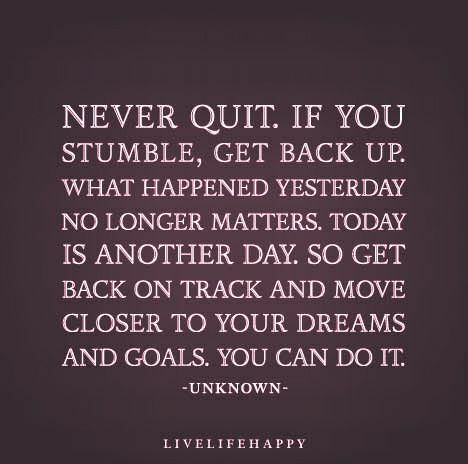 It’s so important to be able to get back up when life knocks you down. This is especially true when it comes to setting goals.